InviteBox makes it breathtakingly easy to add a state of the art referral program to your website. With just a few clicks your users will be able to share your product or service with their social network peers or webmail contacts. And the powerful incentive system featuring instant rewards will help you make sure that you are making the most of word of mouth. 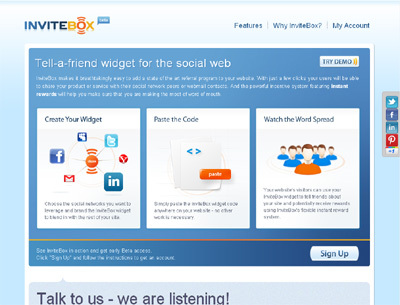 InviteBox is the simplest and the most features rich widget for running referral campaigns. We have incorporated the very best techniques that worked for titans like Dropbox and the recently hyped upstarts like Hipster and made them available to everyone.